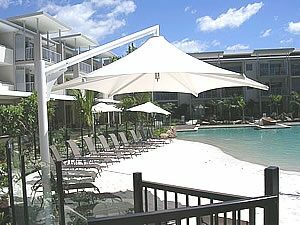 Our hexagon cantilever umbrella shades are perfect for smaller play areas, sandboxes, seating areas, and more. They have a single post located outside the canopy and suspending it from above. This is known as a “cantilevered” design. This design is stylish and modern, but for engineering reasons, it is more appropriate for smaller hexagon and octagon shade canopies. (For larger single post models, see our center-post umbrellas). Hexagon and octagon umbrella cantilevers are available in several standard sizes, including 10′ x 10′, 12′ x 12′, and 14′ x 14′. For more information on sizing, just contact us toll free. The height of a cantilever shade is the height of the outside edge above ground level. The lowest height we offer is 8 feet, which is actually 11 or 12 feet high up in the center of the canopy. We also offer 10 feet and 12 feet heights. Many colors of canopies available. Please see diagram on this page. 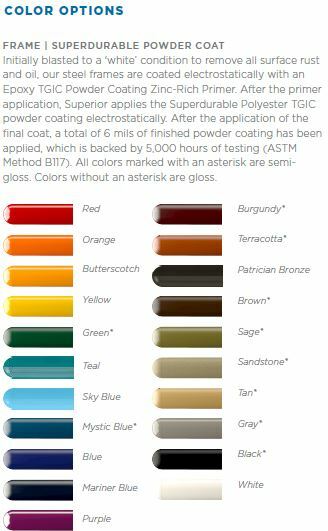 Many colors available, with powder-coat painting. Please see diagram on this page. Pricing for cantilever umbrella shades — please phone us today.